The Giraffe Juice Project: The Giraffe Juice books are the center piece of this project and are the result of many people's work over a number of years. We've had fun putting them together and are excited to share our eBooks freely because we believe that the more people who have Giraffe Language in their lives, the more fun we can all have. In order to contribute to the reduction of violence on our planet, the vision of the Million Giraffes Project is to distribute a million copies of Giraffe Juice in either its hard copy or digital form by January 1, 2012. 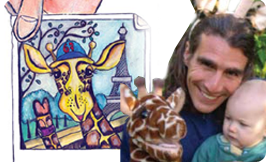 Marci Winters and JP Allen wrote Giraffe Juice at the request of Dr. Marshall Rosenberg, founder of the international Center for Nonviolent Communication (CNVC). In addition to the obvious inspiration from Marshall's life work, this book contains many direct transcriptions of dialogues that Marshall created at the 2003 NVC International Intensive Training in Rochester, New York. Thank you, Marshall, for your loving support of this project. The books and this website are the fulfillment of your dream to find fun and entertaining new ways to share Nonviolent Communication with the world. 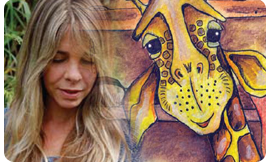 Marci Winters is an educator living on mystical Maui with her giraffe sweetheart, Shai, and magical cat, Jaya. She is a screenwriter, producer, director, and composer. Marci dedicates Giraffe Juice in loving memory of Christian Valentino Arvesen and her beautiful grandmas, Helen Gross and Adele Winters. Her family film Sweetwater, aired on PBS and is endorsed by KIDS FIRST! : The Coalition for Quality Children's Media. Marci is certified in Yoga, Chi Quong, Mediation and Meditation. She envisions a brighter world, graced with beautiful smiling giraffes! Mahalo to Shaikelekuleku, kof gadol sheli, my best friend and brother Jarod Winters and his incredibly supportive, wise wife Par-Par Sonja whose sweetness and love has carried me; The Nettervilles to whom I am indebted to beyond measure; Jill Stone, your friendship is invaluable; Saundra McKenna, my inspired goddess; Caprice Winneman, your heart warms me; Beth Pratt, my faithful friend; and Edna and Amir Arbel for all your yummies! More Mahalos and Todahs to Talia and Doron "Gamal" Hacham, so many laughs; Nitzan Solomonav, Avi "M'Seba", your yummies too; and to Co Co Baldwin, Lesa Sowell, Kathy Doyle, Debbie Siebers, Marni Galef, my soulful sisterhood, Austin, and the Kauai and Maui communities for your support through soulful sister and brotherhood. Tp JP, all the Allens, Limor, and her beautiful kids for sharing the Giraffe Juice vision. And to family and friends at the Sivananda Yoga Ashram in Paradise Island: Carmon you opened my inner eye; Norma, Zoey, and all the Levins; Mala, Michael, Maera, Carol, Belle, Ronni, Sarit, Nicole, Mai, and Yoav in Israel. And especially to my students everywhere who are all my teachers. About Marci's kid's movie: Why are Marci and JP promoting their other creative project here? Because the profits from the Giraffe Juice Project are being reinvested into spreading NVC around the world, this is a wonderful opportunity for them to let you know what else they are up to (and what is giving them the resources to serve the Million Giraffes Project as a mission). www.harmonica.com has enabled JP to share harmonica with people all over the world. JP has been blessed to be able to fund the Giraffe Juice project with profits from Harmonica.com. He delights in helping kids and adults bring the joy of harmonica into their lives. In Austin, Texas, JP founded Aardvark Music School for kids and taught guitar, drums, piano, song writing, and harmonica. He has a particular love for harmonica because of the ease with which beginners and non-musicians are able to freely express themselves through music. He has directed several summer camps for kids sharing music, acting, and peaceful conflict resolution through the process of Nonviolent Communication. As a professional harmonica player, JP played on CNN, Fox News, and toured the world with Grammy-nominated Abra Moore. His love for the healing arts is currently expressed through regular practice of Tai Chi, Chi Gong, Yoga, meditation, nourishing whole-foods, and long distance running. JP completed pre-medical studies, graduating from Northwestern University in 1988 with a BA in psychology and an enduring interest in educational psychology. He is currently living on the island of Kauai, Hawaii. Feel free to contact JP about this website, or the Giraffe Juice Project in general. I feel awestruck in gratitude for the abounding creativity that so many have offered this project. My heart offers an extra special thank you to you Marci. I know that without you this project would not exist. Thank you for your patience, your belief in me, and thank you for bringing this story to life...in full rainbow color of creativity. Passionate about Nonviolent Communication and art, Tamara works as a full-time artist and conflict resolution consultant. She co-owns MasonLaporte Conflict Transformation, teaches art online over at www.willowing.ning.com, and enjoys making empathy monsters and puppets. Tamara worked as a drama and art teacher in an international primary school in Sri Lanka for 2.5 years where she wrote and directed her own school play "Whizzbo the Helpful Skweekabee". She deeply believes that peace is possible through self-enquiry, empathy and compassionate communication. At present she lives in Brighton Hove in England with her partner, the magical Andy. She likes pink bubblegum, avocados, humor and kindness. More of her art can be viewed at willowing.org. Brita Lind and Tania Wolk are the co-owners of Go Giraffe Go Writing & Design Inc., an award-winning graphic design and advertising firm. Brita Lind is a writer and playwright who enjoys living her own dreams and helping others do the same. A believer in, and practitioner of, Nonviolent Communication, Brita believes that NVC holds magical connection and is possible to practice no matter what age we are. Also a practitioner of NVC, Tania's specialties include working with type so words and thoughts are the stars of the pages and using graphic design to make artists' ideas shine. Tania was tickled pantone #239u (deep pink) to have participated in the NVC Parent Peer Leadership Program (PPLP) in 2006. Part of the Peaceful Families, Peaceful World Project of the international Center for Nonviolent Communication and BayNVC, PPLP is a learning ground for parents to deepen their NVC practice and to develop the skills to share NVC with other parents. Go Giraffe Go Writing & Design helps people and organizations do branding and advertising everything from books and music CD designs to brochures, websites, logos and advertising campaigns. Together, Brita and Tania are the moms of two children with whom they share giraffe language as best they can as part of their daily regimen of the heart. Dr. Marshall B. Rosenberg is founder and director of educational services for the Center for Nonviolent Communication, an international, nonprofit organization. In 1961 Dr. Rosenberg received his Ph.D. in clinical psychology from the University of Wisconsin and in 1966 was awarded diplomat status in clinical psychology from the American Board of Examiners in Professional Psychology. Candi Sary has written seven novels, five of them making it to the finals in competitions. She graduated from UC Irvine with a BA in psychology. She lives in coastal Orange County, California with her husband, their two teenagers, and three dogs. She finds spiritual connection in surfing, running, listening to music, and filming the life around her. For more about Candi, see her website. Chris, born and raised in England, is a self professed nerd who likes making things on the internet work. Like building websites and helping online businesses succeed. His passion is story writing and film making, aspiring one day to pick up one of those shiny gold Oscar statuettes. Sarah feels quite lucky to have found this project. She is well known among friends as someone who radiates continuous joy. She is a graphic designer for a nutritional supplement company in Edina, MN and a part-time freelancer. You can see her portfolio HERE. While Sarah dedicates most of her life toward web design and development, she is also a part-time swing dance instructor. She specializes in Lindy Hop and Blues and believes most problems can be resolved with dance. John likes to juggle, play table tennis, and go for long walks in the beauty of Eugene, Oregon, where he lives in intentional community at Walnut St. Co-op. But most of all he enjoys the magic that happens when two or more people are truly with each other, in quiet conversation, or in some other way coming to see the wonder of our living together here. John studied psychology as an undergraduate at Harvard University many years ago, but learned at least as much about people by helping found the Harvard-Radcliffe Science Fiction Association there, and far more from his many explorations since then. He is a process artist believing that we are always in some process, and are blessed with wide responsibility and creativity to experiment with what processes might serve our needs in ever better ways. He engages in many processes that improve his own life and the lives of those around him, and he gets a lot of hope from seeing the rapid spread through the world of many powerful processes; in particular: Nonviolent Communication, wiki, meditation, Open Space and Dynamic Facilitation. John is a member of the National Coalition for Dialogue and Deliberation, and serves as president on the board of the Co-Intelligence Institute, which researches and advocates processes that operate at the largest scales, inquiring into how we can apply the wisdom of the whole (of humanity) to serve the whole. He is also a long-time computer geek, and in recent years has been a formative designer of Wagn, software that extends the power of wiki while maintaining its simplicity. He's also been involved in organizing the Recent Changes Camp series of Open Space conferences on wiki, and has presented on wiki and Wagn at several conferences. John grew up in Massachusetts, and has also lived in the San Francisco Bay Area and in Sri Lanka before moving to Oregon. You can contact him via his website. Laurie Masters, of Precision Revision, is a freelance editor in the San Francisco Bay Area who helps people bring their life work to the world through the printed word. Her tagline is, "I turn what you wrote into what you meant," and many wonderful authors wholeheartedly agree! Laurie is passionate about many topics, including living lightly and sustainably on the Earth, the compassionate Nonviolent Communication work of Marshall Rosenberg, ethanol fuel, and the low-fat vegan lifestyle. Check out her recent book projects and customer testimonials at www.GreenSongPress.org. The Center for Nonviolent Communication (CNVC) is a global organization whose vision is a world where all people are getting their needs met and resolving their conflicts peacefully. In this vision, people are using Nonviolent Communication (NVC, referred to as "Giraffe Language" in this book) to create and participate in networks of life-serving systems in economics, education, justice, healthcare, and peacekeeping. Nonviolent Communication training evolved from Dr. Marshall Rosenberg's quest to find a way of rapidly disseminating much-needed peacemaking skills. The Center for Nonviolent Communication emerged out of work he was doing with civil rights activists in the early 1960s. During this period, he provided mediation and communication skills training to communities working to peacefully desegregate schools and other public institutions. Since the center's inception, the response to Nonviolent Communication training has been extremely positive. It is seen as a powerful tool for peacefully resolving differences at personal, professional and political levels. To learn more, visit www.cnvc.org online. Since the inception of the Center, the response to Nonviolent Communication training has been extremely positive. It is seen as a powerful tool for peacefully resolving differences at personal, professional, and political levels. Dr. Rosenberg provides Nonviolent Communication training in 59 countries; Afghanistan, Argentina, Australia, Austria, Azerbaijan, Belgium,Bosnia, Brazil, Burundi, Canada, Colombia, Congo, Croatia,Czech Republic, Denmark, Dominican Republic, England, Estonia, Finland, France, Georgia, Germany, Guyana, Hungary, India, Indonesia, Ireland, Israel, Italy, Jamaica, Korea, Luxembourg, Malaysia, Malta, Mexico, Moldavia, New Zealand, Netherlands, Nigeria, Norway, Palestine, Poland, Portugal, Romania, Puerto Rico, Russia, Rwanda, Scotland, Senegal, Sierra Leone, Singapore, Slovenia, South Africa, Sri Lanka, Sweden, Switzerland, Turkey, United States, Yugoslavia. He works with such groups as educators, managers, mental health and health care providers, lawyers, military officers, prisoners, police and prison officials, clergy, government officials, and individual families. He is also active in war-torn areas and economically disadvantaged countries, offering Nonviolent Communication training to promote reconciliation and peaceful resolution of differences. To find out more about Marshall and the Center for Nonviolent Communication, go to www.CNVC.org. JP extends an extra special thank you to Marci Winters for bringing Giraffe Juice alive with butterflies and rainbows and for her unwavering support of this project . Marshall Rosenberg, Inbal Kashtan, Jim and Jori Manskee, Diane and Peter Allen, Alan and Janet Winters, Sue Rudolf, Daniel, Ariela, and Olivia Montbriand, Kristen King, Kyra Freestar, Dian Killian, Christa Morph, Limor Farber, Amy Chang, Rosa Russell, Scott Lewis, LaShelle Chardé, Jeff Brown, Joel Heller, Michael Parish, Jessica Vanlandingham, Nadine Helm, Robert Gonzales, Ike Lasater, Sigal Shoham, Rachel Clark, Glenda Mattinson, Blake and Astrid Drolson, Steven, Merlyn and Kalei Ruddell, Sherrie Anderson, Isa Maria, Tewa Holloway, Nick Good, Codi Bear, Rose Miller, Morgan Quinn, and the Creative Spirit and Infinite Wisdom that lives in all of us. Dalai Lama, Mahatma Gandhi, Mother Teresa, Nelson Mandela, Maya Angelou, Henry David Thoreau, Desmond Tutu, Martin Luther King, Jr., Michael Franti, Eleanor Roosevelt, John Lennon, Yoko Ono, Oprah Winfrey, Marshall Rosenberg, Indira Gandhi, Rosa Parks, William Wilberforce, Jane Goodall, Lech Walesa, Thich Nhat Hanh, Lao Tzu, Harriet Beecher Stowe, Gloria Steinem, Virginia Brown, Princess Diana, Daw Aung San Suu Kyi, Golda Meir, Morihei Ueshiba, Benazir Bhutto, Harry Belafonte, Albert Schweitzer, Riane Eisler, Anderson Sá, Astrid Lindgren, Bruno Hussar, Susan B. Anthony, Anna Reeves Jarvis, Julia Ward Howe, Chiune Sempo Sugihara, Colman McCarthy, Dennis Brutus, Maharishi Mahesh Yogi, Dikembe Mutombo, Ellen Johnson Sirleaf, Greg Smith, Helen Caldicott, Henry Salt, Iqbal Masih, Iris Berben, Joan Baez, Julia Butterfly Hill, Kim Dae Jung, Kujtesa Bejtullahu, Lester Pearson, Paul David Hewson (Bono), Maharishi Mahesh Yogi, Jackson Brown, Eddie Vedder, Martti Ahtisaari, Mary Peters, Mary Therese Winifred Robinson, Nader Khalili, Oscar Arias, Paul Rusesabagina, Rachel Carson, Sabriye Tenberken, Stanley "Tookie" Williams, Sylvia Earle, Vandana Shiva, Wangari Maathai and...you. CLICK HERE for more about the Millions Giraffe Project.